Can you spot the circles hidden among these rectangles? Oh no ... not again. Nicholas J. Johnson, an Australian author and entertainer, shared a head-turning image on his Facebook page that has netizens all over the world scratching their heads. "How many circles are hidden in this picture?" Johnson wrote, adding that it took him "literally 30 minutes" to spot the hidden shapes. If you're having trouble spotting the circles, don't go crazy. Just relax your eyes a little bit while you're staring at the photo and, hopefully, you'll be able to see the hidden figures. So, how does this clever illusion work? 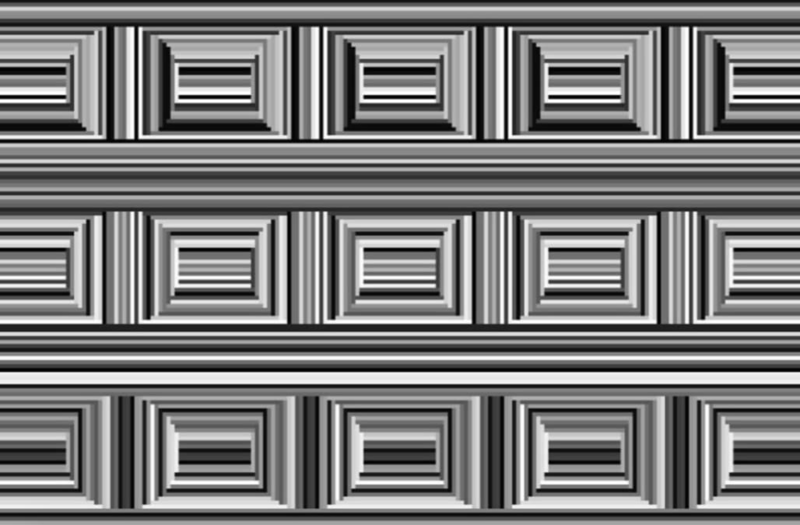 "The Coffer Illusion works because our brain groups the grey, black and white lines in different ways," Johnson went on to explain in his post. "They can be grouped into rectangles OR circles." According to TODAY, the Coffer Illusion, which was created by Anthony Norcia of the Smith-Kettlewell Eye Research Institute, was a finalist in the 2006 Best Illusion of the Year Contest. It gets its name from the word coffer, which is an architectural term used to describe a series of sunken panels in square, rectangular or other shapes. Still going nuts trying to find the circles? We'll give you a big hint: There are 16 of them in the photo.